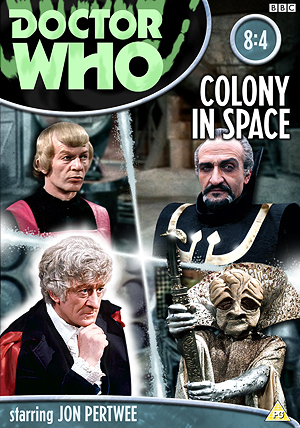 With this story featuring a range of villains and creatures (the Uxarieans can't really be called monsters), a 'multi-part' cover layout seemed the obvious way to go, showcasing the three main 'bad guys' - the Master, Captain Dent and one of the various Primitive races - plus the Doctor, of course. With these four main elements self-selected, I initially envisioned something along the line of my Two Doctors cover: two horizontal panels, one with a Primitive scene overlaid with the Doctor, below one with an IMC scene incorporating Dent overlaid with the Master. Then at some point between being an idea in my head and coming to put it together on screen, the layout had become four separate scenes divided by some graphic device, I think because I was toying with the idea of incorporating the IMC logo in the centre. I even went as far as recreating the logo in Illustrator, but in the end I didn't feel it sat satisfactorily in the composition. When roughing out the layout I considered using the IMC robot in the centre instead, but this also felt awkward so I dropped that too. By this point I'd kind of forgotten the two-panels initial idea, which thinking about it now might have worked slightly better after all. Oh well. The cover began, as usual, with picture research, and it quickly became clear that shots of Dent and the Master dressed as the Adjudicator were conspicuous by their absence. There were a few photos of Dent around, but the only one that could have worked as a suitable portrait shot was in black and white and, although colourable, was rather too grainy when scanned from DWM. I had, therefore, to resort to a screengrab from the programme itself, which has worked well enough in the past but this time, given the image quality even on the restored DVD, resulted in his being noticeably softer than the other characters on the cover. For the Master I did as Lee Binding did on the official cover and combined a screengrab of the Master's outfit with a good photo of his head (from The Claws of Axos so not too distant storywise). The Primitive Priest came from a good quality photo wallpaper from the BBC Classic Who website, while the Doctor was grabbed from the DVD photo gallery. The backgrounds for each character were taken from the programme itself: a handily empty shot of the IMC ship's bridge (just before someone enters through the door on the left); a close-up of the Primitive 'cave paintings'; the main hall area of the colonists' dome, when Dent is surveying it alone having locked up all the colonists; and, behind the Doctor, what is actually the Master's TARDIS just before the Doctor and Jo break in. These were each edited for levels, colour and noise, but with the knowledge they would then be heavily blurred to provide some depth of focus. Finally, for the separating device, no specific design aspect from the show suggested itself to me so I went for some generic energy beam-type rays. Think of them as the radiating power of the Doomsday Weapon, if you like. I say finally, but in fact at the very last minute I made a significant change. Throughout, I guess as a hangover from the half-forgotten panels layout idea, I had positioned the Master in the top-right quadrant with the Primitive Priest below him. I had completed the illustration, dropped it into the cover template (see right) and was ready to upload when it suddenly struck me that the Priest's staff would fill the slightly awkward space to the immediate left of the title quite nicely if I swapped him and the Master round. While I'd liked the idea of it breaking through the 'frame' in the original layout to overlap the Master, in practice the head of the staff was slightly lost against the detail of the Master's tunic. So I bit the bullet and swapped them round. The background for the Priest didn't extend high enough to reach the top of the cover, so I added a rock wall to indicate its underground location. I think this arrangement does work better, so it was a worthwhile change.